According to the Bureau of Labor Statistics’ Census of Fatal Occupational Injuries, there were 106 Wisconsin workers who died due to injury in 2017. This number reflects a slight increase from 105 fatalities in 2016, but Wisconsin’s overall fatality rate dropped slightly from a rate of 3.6 in 2016 to 3.5 deaths per 100,000 full-time workers in 2017. 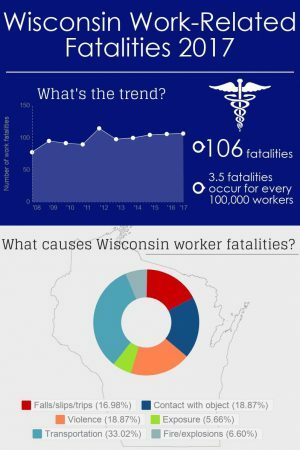 The number of workplace deaths in Wisconsin the past decade (2008-2017) range from 77 in 2008 to 114 in 2012, and average 98 fatalities annually. The final count of occupational fatalities in the U.S. in 2017 was 5,147, according to figures the U.S. Bureau of Labor Statistics released last month. This was a slight decrease from 5,190 total fatal incidents in 2016. The U.S. fatality rate decreased from 3.6 in 2016 to 3.5 cases per 100,000 full time employees in 2017. • The total fatal incidents decreased among industry supersectors such as Manufacturing, Trade, transportation, and utilities, and Professional business services. Increases were noted in Natural resources and mining, Construction, Financial activities, and Government. Education and health services remained constant from 2016. • Transportation incidents caused the most fatalities, as is typically true, though 2017 data show a continued trend in decreased incidents from the prior year, reduced from 38 incidents in 2016 to 35 in 2017. Management occupations, including farmers, were most prevalent with 27 incidents in 2017; transportation workers were the next most prevalent occupation type at 17 incidents. • After more than doubling from 2015 to 2016, violent incidents declined from 23 in 2016 to 20 in 2017, the same number of incidents attributed to contact with objects and equipment last year. • Of the 106 fatal incidents, only 9 were women in 2017, down from 16 of 105 total cases in 2016. • Employees age 65 and over sustained the highest number of fatalities with 29 incidents, up from 23 last year. In 2017, 96 of the 106 work-related deaths in Wisconsin occurred within private industry. Public sector deaths increased from 7 deaths in 2016 to 10 in 2017. Among subsectors, the Agriculture, fishing, forestry, and hunting fatality count increased from 20 in 2016 to 24 in 2017. Construction incidents increased from 12 in 2016 to 17 in 2017, while the trade, transportation, and utilities fell from 24 to 18 incidents. Manufacturing industry deaths fell for the second year in a row with 9 incidents last year, down from 12 in 2016 and 14 in 2015. Transportation incidents comprised the highest number of fatal work injuries in 2017 with 35 incidents, a decrease for the second year in a row, from 38 incidents in 2016 and 46 incidents in 2015. Violent incidents decreased from 23 cases in 2016 to 20 cases; contact with objects and equipment also had 20 incidents in 2017, up from 16 in 2016. Falls, slips, and trips increased from 16 in 2016 to 18 incidents in 2017. Deaths due to exposure to harmful substance or environments remained consistent from 2015 to 2016 at 11 incidents. Fires and explosions resulted in 7 fatalities last year; exposure events were responsible for 6 fatalities. Of the 106 fatalities in 2017, 9 workers were in contractor status, consistent with the prior year. Forty were self-employed while 66 were working for wages. The highest number of fatal work injuries occurred among age group 65 years and older with 29 deaths, followed by age 55 to 64 with 24 incidents. Management occupations (including farmers and farm managers) sustained the greatest number of fatal injuries in 2017 at 27 incidents, followed by transportation and material mover occupations with 17 deaths. Construction and extraction occupations rose slightly from 2016 to 2017 from 13 incidents to 15, while 10 deaths occurred among installation, maintenance, and repair workers. The Census of Fatal Occupational Injuries, part of the BLS occupational safety and health statistics program, compiles a count of all fatal work injuries occurring in the United States during the calendar year. The program uses diverse state, federal, and independent data sources to identify, verify, and describe fatal work injuries. The Wisconsin State Laboratory of Hygiene (WSLH), a part of the University of Wisconsin-Madison, is the state’s public, environmental and occupational health laboratory. The WSLH’s Bureau of Labor Statistics/Occupational Safety and Health Statistics Program has a cooperative agreement with the U.S. Bureau of Labor Statistics to conduct the Census of Fatal Occupational Injuries in Wisconsin.